Collected by: Heidemarie Koch. Edited by: Heidemarie Koch. 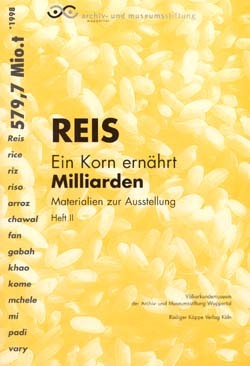 This folder, comprising two brochures, contains the accompanying materials to the exhibition by the Völkerkundemuseum Wuppertal and the Ökumenische Werkstatt of the United Evangelical Mission (UEM) about the importance of rice and the diversity of its uses. Brochure I deals with the physical characteristics of the plant and its diffusion across the world, its history, methods of production, uses and trade. The main focus is on Asia. Brochure II features additional information about rice in Africa, the USA, Asia and Europe. The greater part is made up by an explanation of the religious and cultural importance for the societies involved. A selection of rice recipes from around the world completes the brochure.